To those of us who live and breathe social media every day, it is easy to forget that not everyone is as comfortable online as we are. In fact, many people have concerns about being too visible online and some don’t want to be online, period. Yes, there are people who, by choice, do not have Facebook, Twitter or Google+ accounts. To my fellow social media aficionados, I realize this may come as a shock. A few days ago, I had a chance to have lunch with a dear friend. Lola is successful and intelligent, as well as both technology and business savvy. Naturally, given my work, the conversation turned to the topic of social media. Lola doesn’t use Facebook. She never has and has absolutely no interest in starting now. Though she has never used Facebook, she has extremely strong opinions about many aspects of the widely popular social networking site, ranging from privacy to rampant oversharing to the implicit meaning of the Like button. I left our lunch wondering…How could someone so bright know that she was opposed to one of the most popular activities in the world without even trying it out herself? Wasn’t she curious in the least bit? Hadn’t she read articles about business-related successes on Facebook, along with the articles about oversharing and privacy risks? If we were talking about something difficult or dangerous (say, cliff diving), I’d understand, but Facebook? Using social media is not straight forward. Everyone’s experience – what they hope it will be and what it actually turns out to be – is different. One’s experience has everything to do with whom we connect online. It has to do with strategy, style, preferences, and an understanding of the networking platform. Social media is easily misunderstood. It’s misunderstood when it’s perceived as content, rather than a channel through which content is shared. It is misunderstood when it is seen as a tool which defines one’s experience, rather than a tool which can be used to tailor one’s experience. Would we refuse to use the telephone if we didn’t like the way other people were using it? 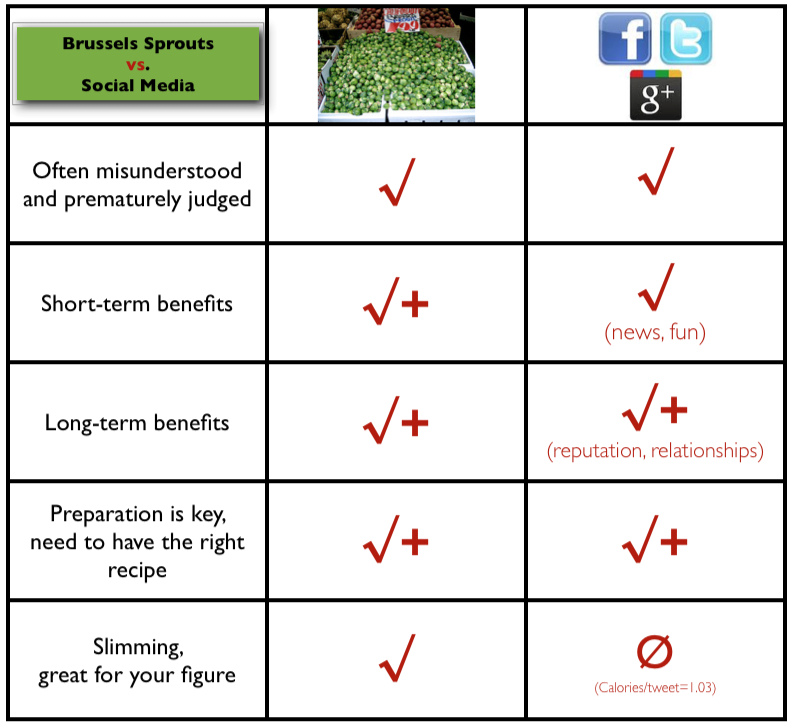 Social media is like brussels sprouts. Well, kinda like brussels sprouts. It’s the brussels sprouts of the internet. 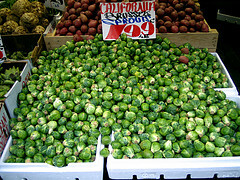 Brussels sprouts have been described as ugly, smelly and bitter, yet they are rich in disease fighting nutrients. Most people I know despise brussels sprouts; would only consider eating them if no other food was available within a 400 mile radius. Many of these same people have never eaten a brussels sprout or haven’t had one since they were a child. Like social media, brussels sprouts are/can be very good for us, yet both are frequently dismissed based solely on what we’ve “heard” about them. I’ve put together a handy scientific* chart illustrating this point. When I was young and didn’t want to try a new food, I was told I had to take a No, thank you helping. A No, thank you helping was a small sampling of whatever I was trying to avoid. It was a taste, just enough for me to decide if I truly did not like the food based on my own first-hand experience, rather than decide based on its purple-ish color or the fact that my sister cried when she tasted it. Is it possible to take a No, thank you helping of Facebook (or other social media channels)? I propose that it is and that it is simple to do so. One need only to set up an account, connect with interesting people or organizations and periodically read what is being shared. If something seems interesting, it is easy to add a comment and contribute to the conversation. While this small taste will not be the same experience as when one is fully engaged, it is possible to skim the surface and get a sense of how others are using social media. At a minimum, it may facilitate a more informed decision. On a personal level, I take No, thank you helpings on a regular basis when it comes to something new or something I haven’t tried in a long time. I’ve hated brussels sprouts for as long as I can remember. A few weeks ago, on a whim, I decided to give them another try, another No, thank you helping. While I don’t expect them to become my favorite food anytime soon, I was surprised to find how much I liked them. All it took was the right recipe and an open mind, and a willingness to give them another try. so you don’t miss any future Almost Savvy social media updates, events and news. Braised with wine, chicken stock and tossed with Parmesan, yum! Oh, Facebook… I come across this attitude a lot, working with musicians and business people who didn’t “grow up on the Internet.” I love the telephone analogy. I also understand how overwhelming social media can be. Even a lifelong member of the “what’s new let me try it” club like me hit overload when Pinterest came along. I found myself saying please no, don’t make me learn another one! I’m with you on the overload, Bev. With new sites launching weekly, we do have to pick and choose wisely. It becomes difficult to be everywhere all of the time. Excellent blog – I found it resonated with me 100%. Lack of time and safety issues are top of the list of reasons why some of my wider network haven’t adopted social media for their companies, and for themselves. The crux of the matter though is the ‘open-mind’ of the client. That ‘NO-THANK-YOU-HELPING’ is all it took for most of my clients. I like the analogy … it’s spot on. My strategy is to prepare them adequately to enable them to engage on 3 platforms, 3 times a day, over 3 days – I refer to it as my ‘3x3x3 project’. Using screen-sharing as a ‘hand-holding’ device most clients have settled into it very confidently indeed. Adoption of a disciplined approach to social media I think helps the small business owners to get best value from the experience. It is easily possible for SB owners to make the maximum of the syndication possibilities of the channels without getting bogged down too much by the creation of a fast-flowing stream of content. Syndication of material and timing of delivery are the crucial factors which influence success. Thanks for sharing your experience Irene.